This is the view from the basement stairs looking over the bannister. You can see my collection of rubber stamps on the white wall shelf. The dresser below them is full of fabric. The cardboard along the wall contains two glass desktops that I plan to use as cutting tables as soon as I purchase some adjustable tressle legs from IKEA. 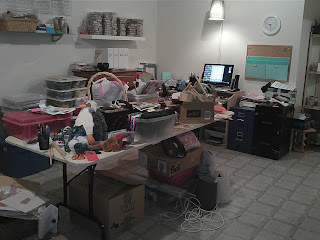 The table is covered in things I still need to sort through and find a home for. This wall along the stairwell is pretty much finished. 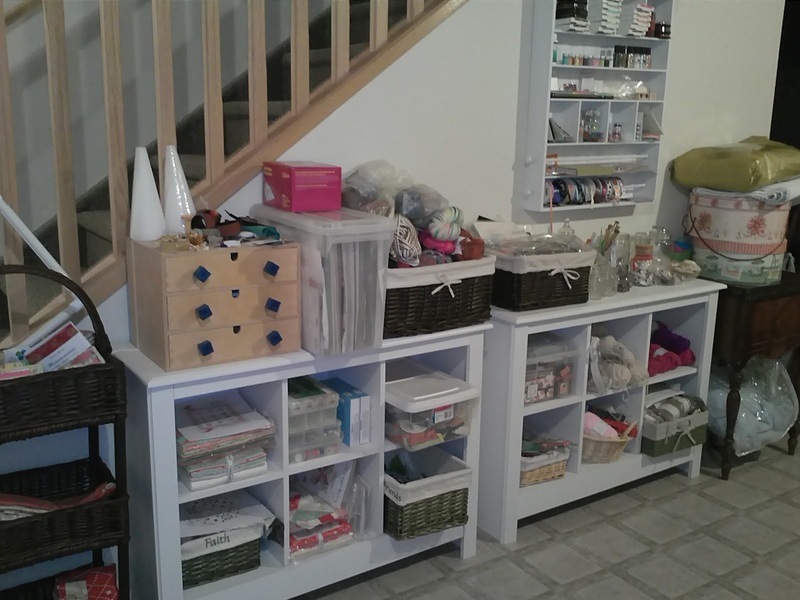 I was going to buy 'expidits' from IKEA but then we spotted these white display shelves at Walmart at a fraction of the cost and they actually work better in the space. The craft storage unit mounted on the wall was bought a couple of years ago with a Michael's gift card from my brother. 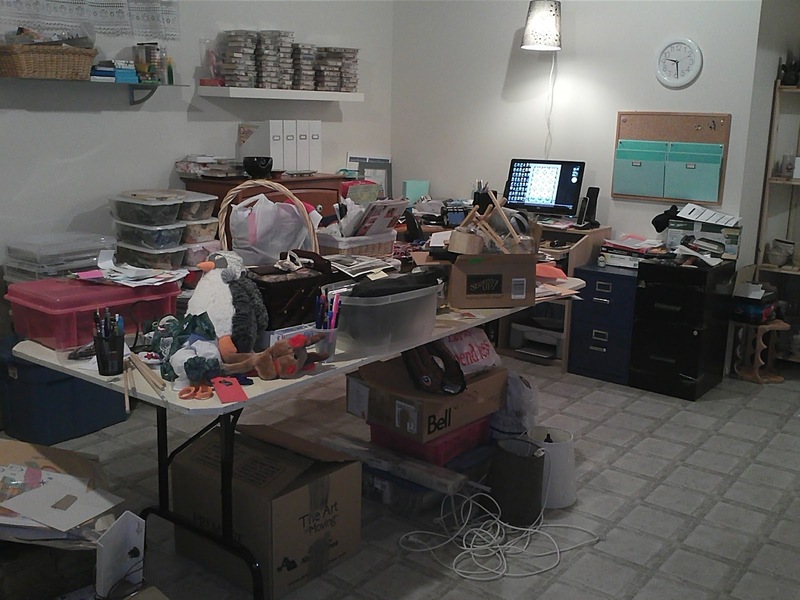 The cabinet under the hat boxes on the right contains my grandmother's sewing machine that you see in my blog header. 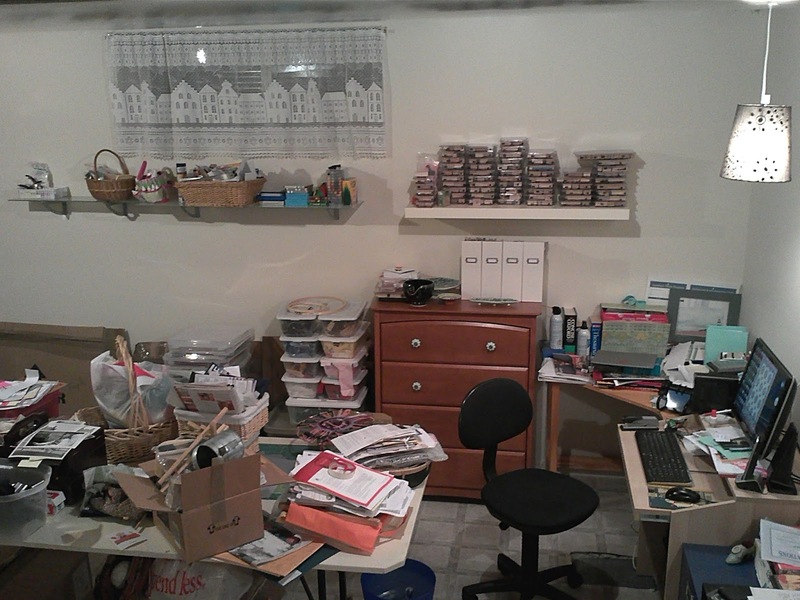 Here is another shot of the wall of crafts supplies from another angle. This wall has supplies for quilting, knitting, card making and rubber stamping. And here is another look at the table of shame. ;) A bit more work to do here. And my little home office area is at the end of the room. 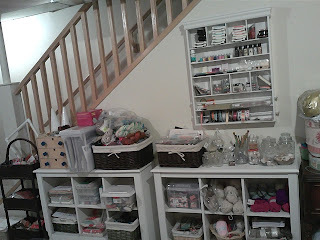 My sewing table is not in view but it's covered in fabric that I need to find a home for. I am hoping the shelves on the tressle legs will be able to house some of it. So what do you think so far? This is a much nicer space than I had in the other house. I wouldn't even dare post pictures of that space. I am finding I am running out of spots to stash things already. Yikes!